Goodness, that was a fun and educational autobiography, a delightful rabbit hole to explore. I just finished reading Planting Doctoring is Fun by Cynthia Westcott (1957, D. van Nostrand Company, Inc). 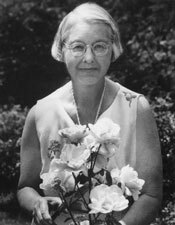 Westcott, born in 1898, graduated from Wellesley and then went to Cornell to study for her PhD in Plant Pathology. She took on many clients in the New York area and proceeded to live the life of a plant doctor, writer, traveler, plant disease researcher, and lecturer. She seemed to have had no qualms about heading out to drive to Florida, Texas, even California in her Ford. Somehow, there was always someone waiting for her at her destination, either someone she knew or someone who had been introduced to her by letter. I figured out a few pages into the book that I own one of other her books, The Gardener's Bug Book, one of the few gardening related books that my Dad happened to own. I am ever so close to ordering up copies of The Plant Doctor, Garden Enemies, and Anyone Can Grow Roses. I worried a bit about Westcott at times, heading out to her client's gardens with chemicals and plant sprayers. She usually hired a helper to haul most of the equipment and pump the sprayer, but did most of the spraying herself. She wrote, though, that she was very careful with the chemicals, avoiding spills, being careful about where she dumped extra amounts, and never leaving them out where an animal or child might get into them. Every year, she opened her garden for a day, when the roses were at peak, to show how anyone could grow roses. She sent out invitations, baked hundreds of cookies and mixed up gallons of punch to serve to the hundreds who showed up. I did wonder how a gardener from "the north" could learn enough about azaleas and later camellias, to solve the puzzle of the diseases that were ruining their blooms. The first answer is on page 152. "The azaleas were not the low shrubs we have in New Jersey. They were the big Indian varieties, much taller than I was. Spraying was arduous but I enjoyed every single minute of it. I kept remembering the chapter in Elizabeth Lawrence's book on Southern gardening, titled "Spring Comes in February". There's Elizabeth Lawrence again, a very connected gardener, in her own right. Westcott and Lawrence met each other in the early 1950's. Page 215... "Cora Harris, gardening editor of the Charlotte News, gave a luncheon and there was tea with Elizabeth Lawrence, who writes so charmingly of Southern gardens." This is quite a rabbit hole. Reading Westcott leads back to Lawrence. Perhaps it is time to read some more Elizabeth Lawrence? Boy, that read didn't take long! She is indeed a very amazing woman. I am intrigue on her biography so I think I should read it. Thanks for the share. Ahh sounds a good read will try and hunt out a copy of her books! Carol, you do such a wonderful job of distilling just enough of a book's plot (and of course it's always about the story) to make me want to find a copy for myself. You've captured the cojoining of story and gardening for a delightful read! Thanks for sharing. I am going to see if I can find a copy.